After last weekend’s horrific performance against Melbourne, questions are starting to be asked about where the Panthers are headed in 2019, with pressure building on everyone from the Chairman to the coach, players and anyone else with a security pass that grants them access to the Panthers Academy. The questions are fair enough. Writing this side off is not. If Penrith fans have learned anything over the past few seasons it’s that this team has a tough resilience and a strong bounce back factor. The fat lady has barely warmed up, let alone started singing. But yes, there are reasons for concern. Not one Penrith back has scored a try this season, suggesting there’s some real issues with how James Maloney and Nathan Cleary are performing in the early part of the season. And while the forwards may be crashing over for tries, they’re certainly not getting the yardage required, with not one of them running for more than 100 metres against the Storm. Many have suggested that Ivan Cleary should make wholesale changes, with Dylan Edwards in the firing line after a very shaky performance against the Storm in Bathurst. While Cleary may eventually be forced to shake things up, making dramatic changes now is not the answer. The Panthers have banked on the likes of Edwards and Cleary to guide them for many years to come, and making short-sighted changes now will shake the foundations of what the club is trying to build. Cleary has backed Edwards and kept him at fullback this weekend, giving him a shot at redemption. Isaah Yeo and Viliame Kikau return from injury, adding some much-needed potency to Penrith’s edges. The return of Kikau will be particularly interesting to watch – he was talked about all off-season and there’s no question the Panthers thought plenty of points would be coming on his side of the field as a result of his powerhouse efforts. Penrith’s defence hasn’t been too bad in the three games so far this year, although it was disappointing to see the side put up the white flag against Melbourne once it became clear that victory was impossible. The real problem is the side’s attack, which looks about as threatening as Clive Palmer around a salad. It has been limp at best, inept at worst. That’s not to say that the side hasn’t been trying. Penrith’s short kicking game has clearly been a focus in the off-season, but at times it appears Maloney and Cleary are trying too hard to make something out of nothing. It will surely click eventually. The first steps in righting the ship is to focus on the fundamentals. 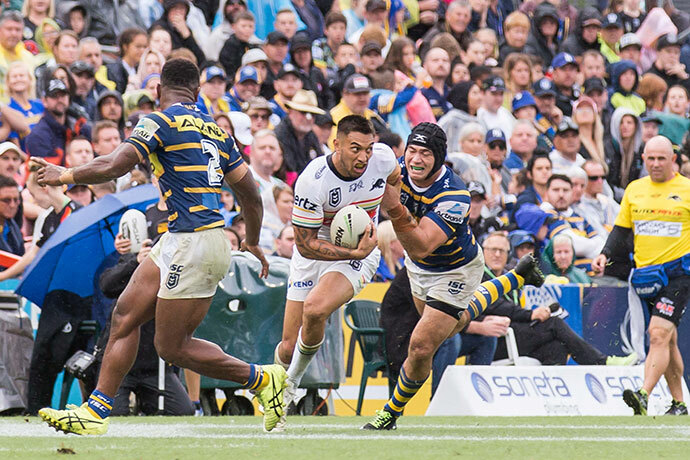 Dropped balls and silly errors – like being stripped of the ball on three separate occasions – were the difference between a competitive game and a thrashing last weekend. Of course, we all know the juicy narrative that this game has produced. Ivan Cleary, who walked out on the Tigers at the end of last year, faces his old team for the first time. A number of players, including Russell Packer, have made it clear that there’s still some pain at the Tigers surrounding how the whole thing went down. There is no love lost between Penrith and Tigers fans either, so this is a real grudge match in the making. Penrith will bounce back in a big way. Penrith and Wests Tigers do battle at Panthers Stadium on Friday, April 5 at 7.55pm.